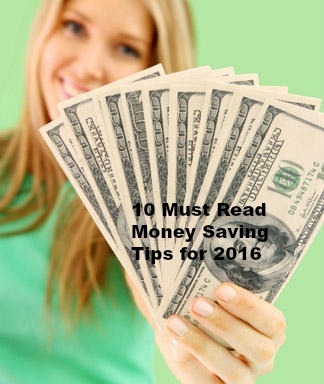 10 Must Read Money Saving Tips For 2016 1) The more you run around, the more you spend. Those extra trips to the store for eggs, milk, bread…whatever can add up. Do you really ever just buy that when you run to the store? Most of the time probably not. The more times you go to the store the more you will spend. The solution. Meal plan and go with a grocery list. Plan your meals around what’s on sale for the week too. 2) Utilize free public activities. Get your taxes worth! Use free services like, the library, you can check out books instead of buying them, rent movies, music and even use the internet. Walk your kids to the park. If you have a neighborhood park like I do, take a walk, get some exercise (save money on gym as well) my kids love our park. You can take a ball and play soccer, have a picnic, or just use the trail. Our local park has an amazing nature trail and even has work out equipment like exercise bikes you can stop and use. 3) Research sales cycles. I don’t know about you but I love saving money on everything. I rarely pay full price for anything. It pains me to pay full price. Plan ahead. It’s Jan. 2016 now so I like to think 6 months ahead so I will be looking for summer clothing, shoes and even things like camping items, pools, etc. This is the best time to buy these kinds of items when the demand is the lowest. If you are a re-seller (see my eBook Money Making Mommies for more on this) you know this is the best time to buy your inventory for the next season. You can get your max. return this way. 4) Change adds up. Think you can’t save? Think again. When you get paid go to your bank and ask for the amount you would like to save for the week or the month, etc. in change. Want to save $100 every time you get paid? Ask for that amount in quarters. Then put this money in a 5 gallon water cooler jug. Save for one year and then either take to the bank and get cash or even better if your company does 401k matching contributions use it for that. You will have $4800 for just one year, just from some quarters. Not a bad deal right? An easy way to trick yourself into saving. I don’t know about you but for me change feels less like real money, so I’m less likely to use it. 5) If you are thinking of making a big purchase like new furniture. Stop yourself! Think to yourself first….can I buy this used? You can save half or more just by buying used. I have young kids so I took a vow not to buy any new furniture until they are off to college. 6) Evaluate your budget and if you have cut back everything you possibly can. You may just need to earn more money. There are so many ways you can do this at home these days in your spare time. Check out, textbroker, Upwork, Elance, even Craigslist under gigs, sell on ebay (see my ebook How to sell on Ebay like a BOSS: Seller Secrets revealed). 7) Make things yourself. Learning the value of doing something yourself is priceless. Learn how to fix a faucet, dry wall, or even learn how to repair a seam or take in a dress. Save your money and do it yourself. 8) Learn how to do your own taxes. Many tax schools offer free taxes; you can even secure employment this way. You can save hundreds every year just learning this one skill. Save money on other fees like legal fees by learning how to prepare legal forms yourself. Or instead of hiring a lawyer, hire a paralegal. Yes they don’t offer any legal advice but you can save big on things like divorce and bankruptcy. 9) Don’t be afraid of discount stores. I love The Dollar Tree (see my youtube channel mommas2monkeys for haul videos) I find so many things that other retail stores like Target and Walmart have like name brand makeup, hair products, household items, décor, birthday supplies, but for only $1. 10) Sign up for a credit monitoring service. Raising your credit score could mean the difference in thousands in interest or it could mean you won’t qualify at all for that car loan or mortgage. Knowing you score is invaluable.